What can you do with Backup Cow? 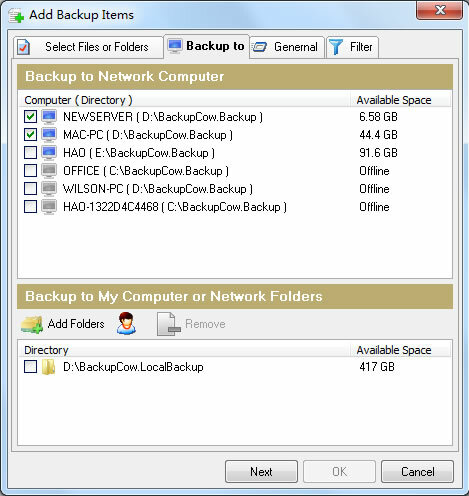 ----Backup Cow can backup data to another PC,such as Windows 2003,Windows XP,Windows 7,Windows 8,Vista,etc. ----Backup to local folders,USB and external hard drives.Unlike other backup software,Backup Cow lets you bidirectional-backup,that means you can backup files from your USB,or you can backup files from your external hard disk. ----Synchronize files and folders every any desired time interval.When you are busy or out of office for work,you can set up a desired period that you can easily to backup data automatically. If you want to backup any files or folders to remote computers,Backup Cow can help you a lot.It allows you to backup and synchronize to multiple remote network.No matter what distance,no matter how many computers you want to backup to,Backup Cow can be a powerful tool. When you want to backup files to another PC,you can input the IP address or a domain in Backup Cow option.Just need to know the desired PC's location and IP address ,you can access to the computer conveniently. There is no need for you to manually connect over LAN,when you run Backup Cow ,you will see other computers also run this software ,after that,you and your team can backup files to each other's PC.In addition,you can start the application when Windows start up. Computers can connect together by joining a same network group, usually for remote network connection.Just several simple steps,network group connection can be easily integrated . During backup ,you can view backup status,adjust backup speed ,simultaneous file amount .Also,if you can pause,stop and resume any backup task. How to use Backup Cow? 1.Uncompress the download package and double click "BackupCow_Setup.exe" to get started. 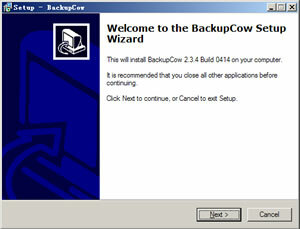 Then click "Next" in the coming "Welcome to the Backup Cow Setup Wizard" interface to continue. 2.Click "Next" to continue in the "Select Destination Location" interface, and setup will install Backup Cow into the default folder. If you would like to select a different folder, click "Browse". 3.Click "Finish" in the last "Completing the Backup Cow Setup Wizard" interface to exit Setup. How to Back Up and Sync Files Between Multiple Computers? What you can gain from Backup Cow? Backup Cow provides strong features but low-cost charge,you just need to pay least money.As a company,you must have lots of data to backup and synchronize,traditional backup solution can no longer satisfied you .With the increasing backup requirements,you need to use modern software to handle such huge amount of data. With Backup Cow,you can create a group between your community and friends easily.After setting up a group,you just need to input the group name and group password,you can engage the backup activity .You may like to travel around the world and take some amazing photos,now,you can share to your friends by joining the same group . Backup Cow support secure backup with encryption.Any one who want to access your computer should gain the password.Without password,he or she could not attack you own PC,which protect your data's security. In today's society,in order to give you a good chance to backup data,please try Backup Cow,you will love it!